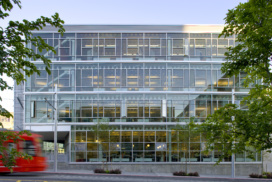 2018 marks the tenth anniversary of The Terry Thomas building in South Lake Union, Seattle. 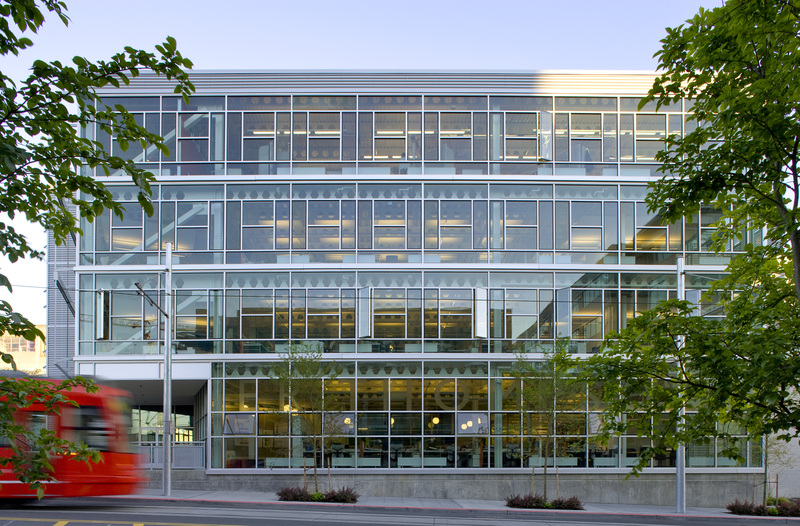 Home to Weber Thompson’s offices, it’s near and dear to our hearts, and is at the core of our sustainable design philosophy. 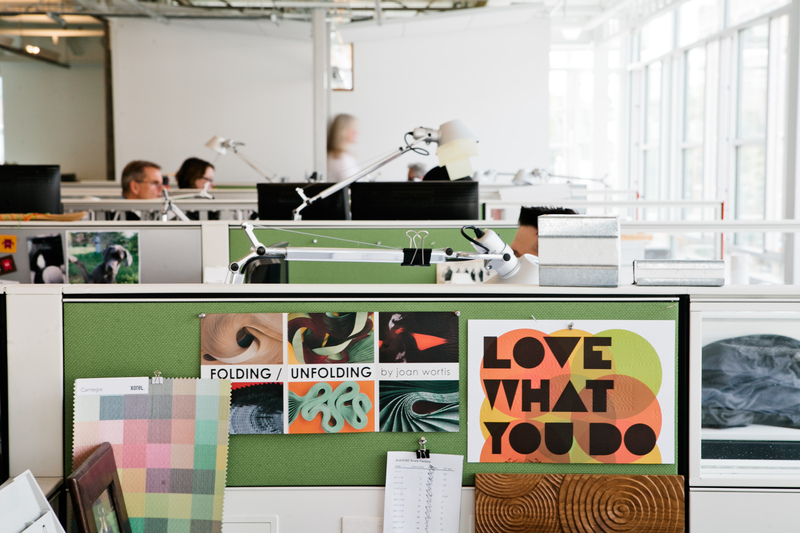 Recently, the marketing team sat down with a few members of WT’s Commercial Office Design Studio to get a little background on what has changed, what hasn’t, and how our commercial office work has evolved in the last ten years. 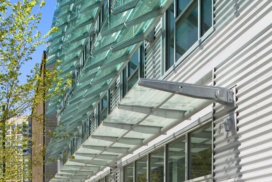 Q1: From your perspective, what makes The Terry Thomas Building unique? 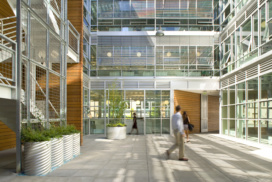 Kristen: It’s a great example of traditional passive design with a strong connection to nature, daylighting, and fresh air. Myer: I love that it’s a combination of low-tech and high-tech solutions. For example, operable windows combined with automated louvers, which are a passive solution that’s been expressed architecturally. 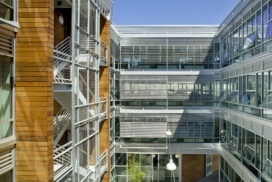 The windows are fully manual, while the louvers are tied to carbon dioxide and temperature sensors. Cody: For me, it’s the visual connection with other tenants and other staff through the courtyard. Can you tell us more about how this building has potentially influenced other green buildings in the last ten years? Myer: The central outdoor stair with green wall, designed to encourage healthy habits and reduce energy use in the Terry Thomas, is a predecessor to current best practice appearing in rating systems like LEED, WELL, and Fitwel. 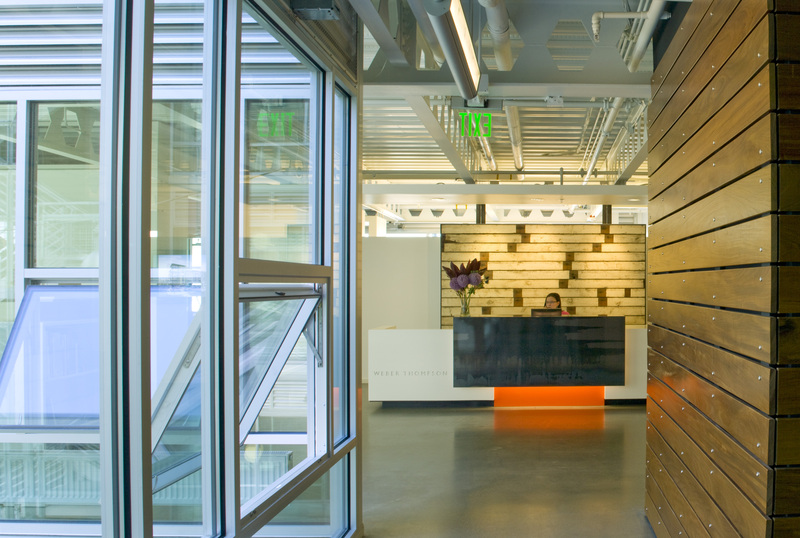 It is akin to the “irresistible” stair in the Bullitt Center and the feature stair of Stone 34. Some of the Terry Thomas’ design solutions have internally influenced our own multifamily and office projects. 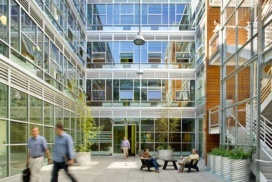 Sunset Electric in Capitol Hill has a similar size courtyard, and locates windows on both sides of each apartment unit as passive design strategy to improve light and air for residents. 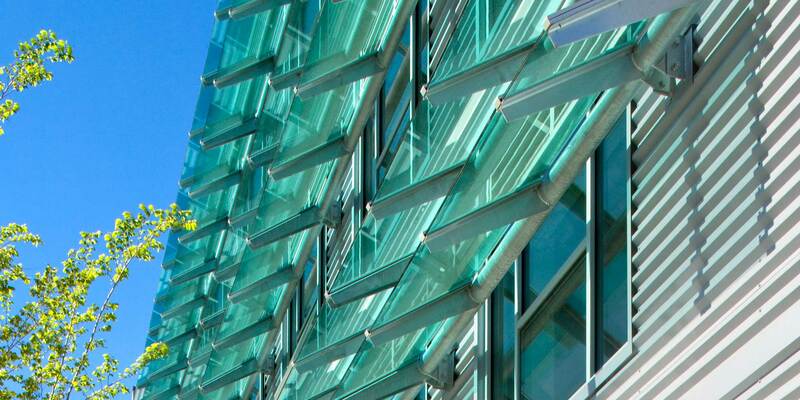 Q2: Which features of the building are still just as innovative today as they were 10 years ago? Kristen: The courtyard as an exterior shared ‘lobby’ of sorts! The building doesn’t have a hard public/private space transition, which is still quite unusual. 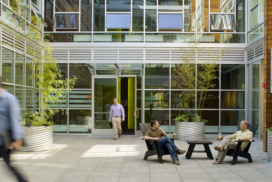 It provides a type of outdoor community living room for everyone from folks eating lunch from the neighborhood food trucks to curious passersby to being used as an extra conference room for meetings in the summer. Myer: The building’s operable windows, daylight, and castellated beams. 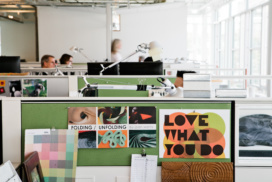 In WT’s office space, the double-duty use of acoustic panels as indirect lighting panels in the workstation area and conference rooms, and as pin up boards. Also, the layout pulling the workstations away from the perimeter prevents “window wars,” allows for even thermal conditions and helps reduce glare. Q3: Are there any features that wouldn’t be viable in a new building today? If so, why? Kristen: The louvers, while a great idea, are too thermally leaky to specify in a new building today. To use louvers these days, we’d need to find an insulated solution. Myer: The operable exterior blinds turned out to be a challenge. We learned that with high-tech, proprietary, software-controlled solutions, you take a risk. The company that created the software to automatically control the louvers went out of business, so now they don’t function reliably as designed. Cody: With global temps on the rise, Seattle may soon not be the passive design “slam dunk” of a climate zone that we’ve been accustomed to. We’re learning more about Passive House and other methods to supplement the strategies used in the Terry Thomas to ensure that we deliver high performance projects. 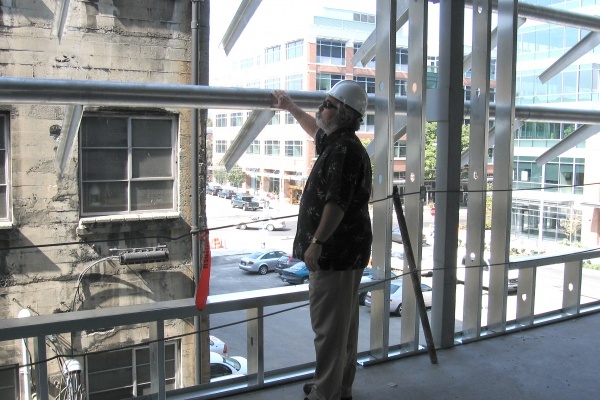 Q4: The Terry Thomas was a legacy project for WT founding partner Scott Thompson. In what ways was Scott’s design leadership expressed in the building, and how has his philosophy influenced the firm’s more recent commercial office work? Kristen: Scott’s focus was on sustainability that, as a goal, is practical and achievable. He preached that you should never focus your design on anything that can be VE’d out; you need to have a strong design parti which can be executed with off-the-shelf materials. 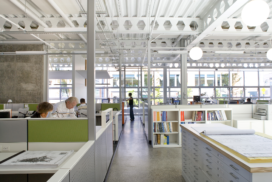 This practical design approach has certainly influenced our current commercial office work. The evolution of The Terry Thomas ‘sunglasses’ are a great example. 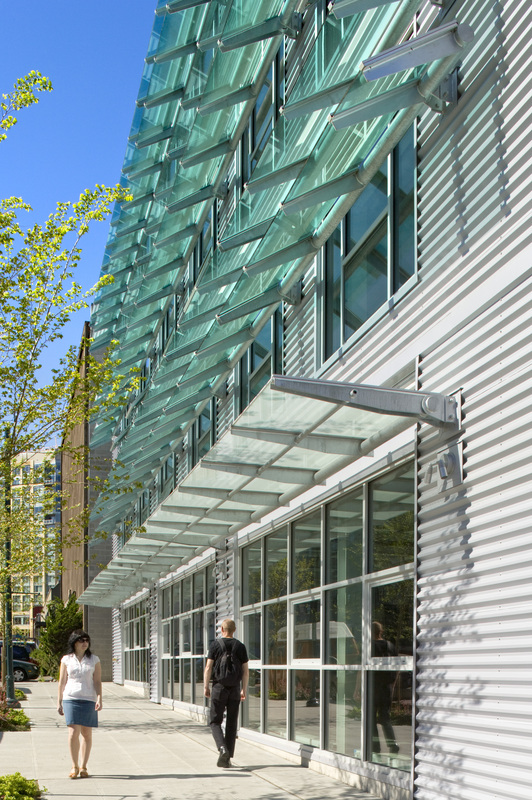 They’ve evolved into metal horizontal shades and blue glass vertical fins at DATA 1, electrochromic (self-tinting) glass at Watershed, and one of our newest projects will likely feature a simple scrim. In all of these projects, the system matters less than the commitment to reducing heat gain via an architectural solution. Myer: Scott focused on simple, low-cost, replicable solutions. He was less interested in creating one-off, high-price-tag projects. He was proud of providing a single, slow elevator in the Terry Thomas, less than what a typical vertical transportation engineer would recommend for a building like ours. This reduced cost while encouraging people to take the stairs, thereby reducing energy loads and burning a few calories. It was a win-win-win. Q5: What is your favorite ‘fun fact’ about the building? Kristen: I love the “ghost shaft” that we added to the core in case whole building air conditioning became necessary, but it’s never been used and most people don’t know it’s there. 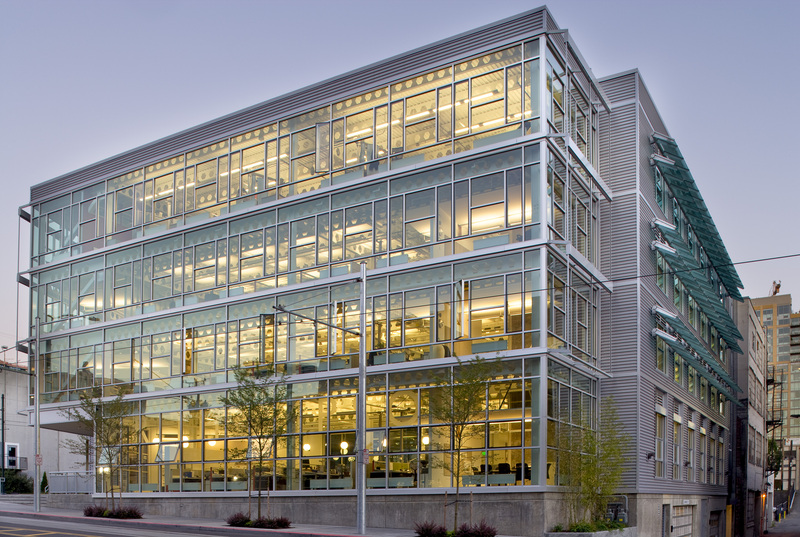 Myer: The building won a national award from the American Society of Heating, Refrigeration, and Air-Conditioning Engineers (ASHRAE), while the building uses simple, time-tested heating technology and doesn’t have air conditioning! Cody: I’ll always love that the former building was Pearl Jam’s practice studio, and the art piece in the lobby is made of reclaimed floor from that building, assembled and dedicated by RAFN, the general contractor. I hope someday Eddie Vedder will come check it out! 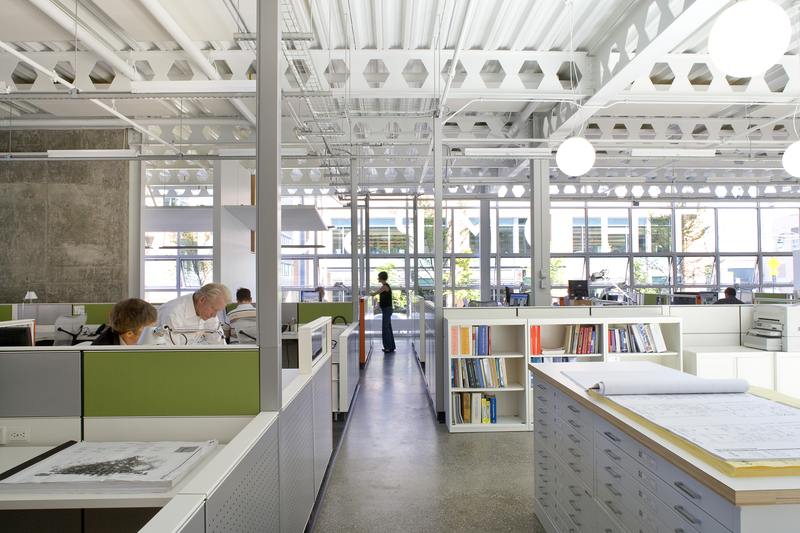 Q6: From day one, the building has been used as a learning laboratory. What lessons have you learned from the building and how have you applied those lessons? Kristen: We’ve learned that 11’-0” floor to floor works very well given an open ceiling, no mechanical system and castellated steel beams! By pulling circulation to the edges of the floorplate we gave everyone access to daylight and fresh air with floor to ceiling glass. On the flip side, as the neighborhood has changed, the increased noise and glare from the sun bouncing off the adjacent Amazon towers has been challenging, but we’re adapting. Myer: We’ve done a handful of studies in our office, to learn more about thermal and environmental comfort, artificial lighting, glare, and workstation energy habits. What we’re really focusing on now is how to affect occupant behavior – for example, how to reduce plug loads when people are not in the office. 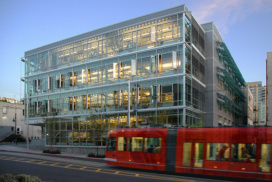 DATA 1, Weber Thompson's newest commercial office building located in the Fremont neighborhood of Seattle. 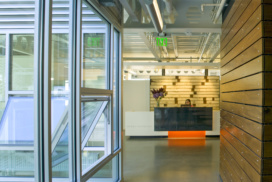 Q7: Weber Thompson has become a leader in boutique high performance office design in the Pacific Northwest. How has WT’s ethos about workplace design evolved since designing The Terry Thomas? Kristen: That evolution is still in progress! With DATA 1, we layered many concepts to create a fabric of sustainable solutions. With our next project, Watershed, we simplified the design with massing shifts that respond to the public view of the water down Troll Avenue while focusing on the Living Building imperatives. With our newest commercial office project, Living Stone, we’re honing it even further. 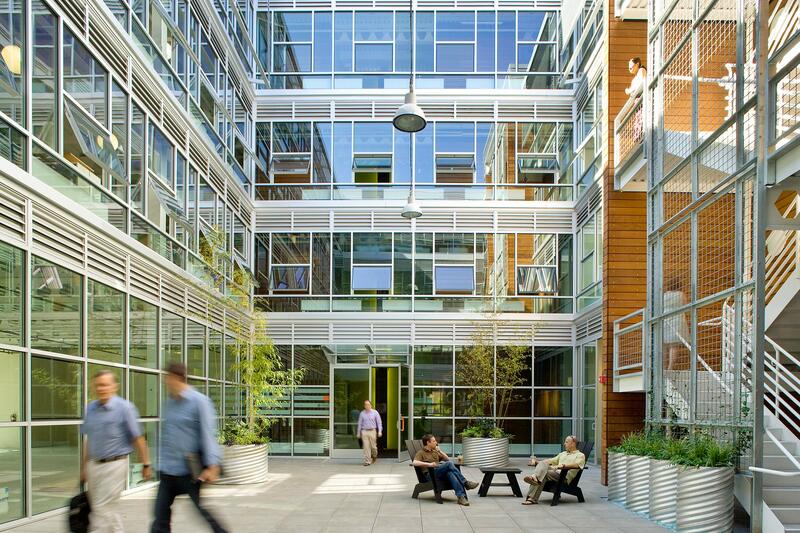 Through it all though, we’ve retained our dedication to creating placemaking opportunities – whether through courtyards, outdoor gathering places, landscape design that showcases storm water education, or contributing to the greater good of the community through design. Cody: We’ve learned a lot from our residential design work that we’ve been applying to our commercial office design; for example, amenity spaces. 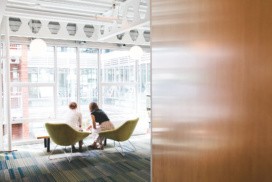 As the talent war continues, offices need to be attractive to employees which includes amenities like bike and locker facilities, work out rooms, etc. But at the same time, there is a need to balance the priorities of all the end users, while still prioritizing building performance. There will always be a balance. Myer: Because we are the core and shell building architect, tenant improvement designer, and tenant, we’ve certainly learned some lessons that apply to many other active projects. We’re learning how to accommodate higher occupancy density while balancing a need for privacy, through small and large conference spaces, phone rooms, etc. 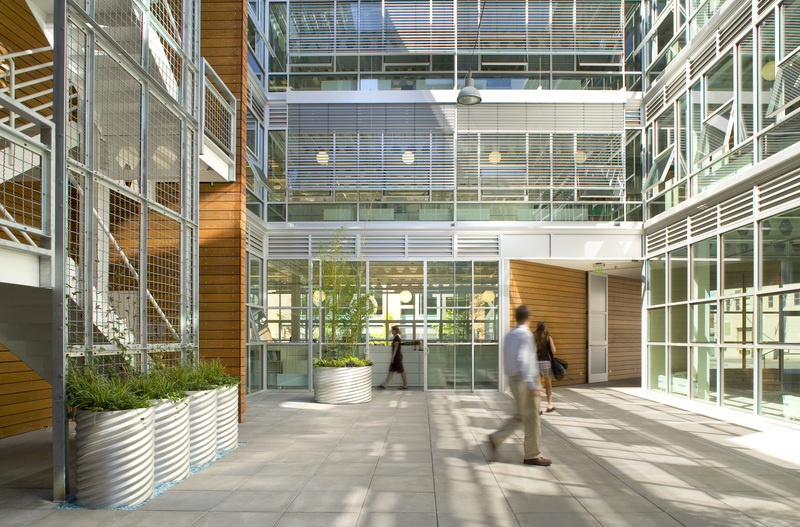 We’re also recognizing the need for real-time building performance data, and understanding whether the opportunities are for the biggest impact for office energy use. 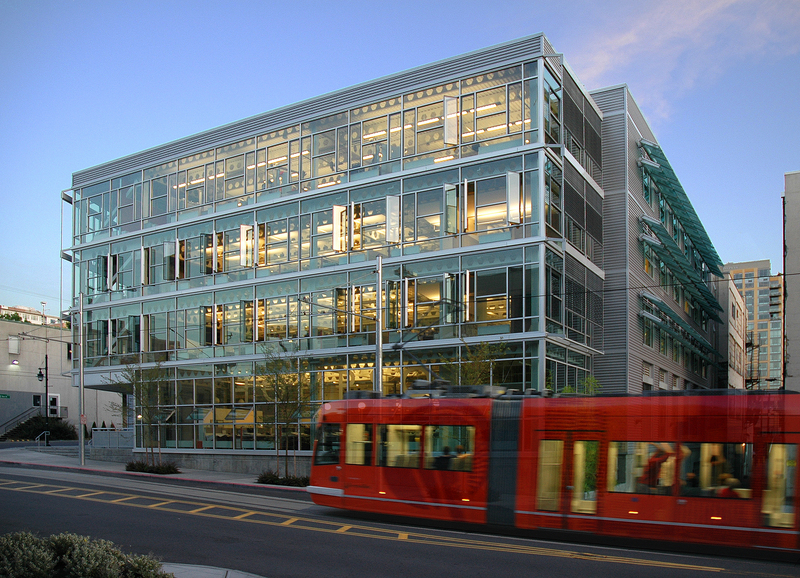 Q8: Ten years isn’t that old for a building, but yet it seems that South Lake Union has changed dramatically. What do you think the next ten years and beyond have in store for The Terry Thomas? Kristen: I foresee that there won’t be a need for two levels of parking in the future, as transit and bike infrastructure improves. It begs the question: what could it become? Retail? Amenities? A water cistern? A huge bike room with lockers? Cody: I think that SLU will become more diverse, and less homogenous demographically. This might open up opportunities for ground related retail or more service-oriented uses. 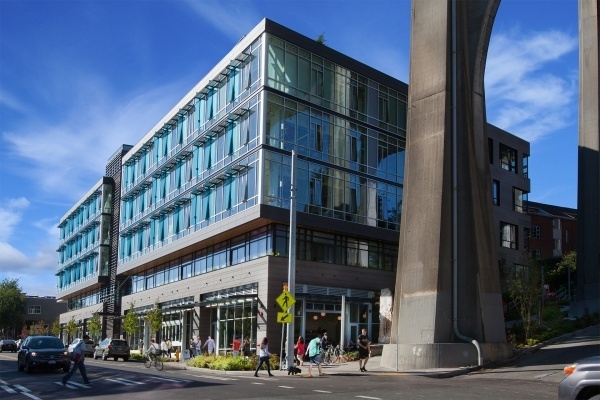 Myer: As the neighborhood grows around us in future development cycles, I see The Terry Thomas becoming a beloved unofficial landmark of South Lake Union, perhaps like the Edith Macefield house (also known as the ‘Up house’) in Ballard. It could both identify with the fabric of the neighborhood and be a vestige of the past. Kristen is Senior Principal and the head of Weber Thompson’s Commercial Office team. 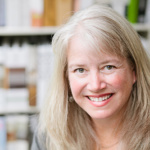 Her background spans from designing a broad range of multifamily and mixed-use buildings to leading teams designing commercial tenant improvements and high performance office buildings. 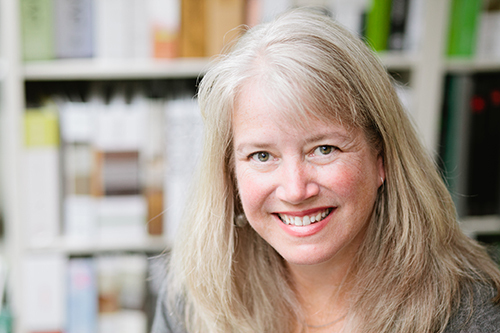 Myer is known throughout Seattle as a dedicated architect with a passion for smart sustainable design. 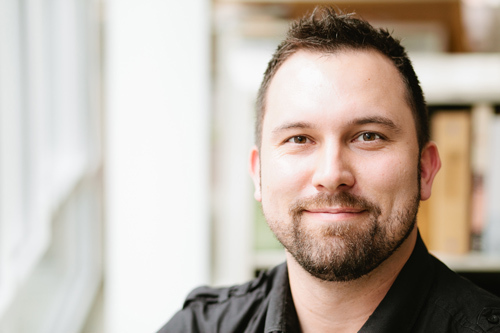 At Weber Thompson, he’s a Principal and Director of Sustainability overseeing and consulting on projects to ensure appropriate levels of sustainable design. Myer was a member of the award-winning design team for Eco-Laboratory which won the national USGBC 2008 Natural Talent Design Competition and a key member of the Office of the Future R&D team. 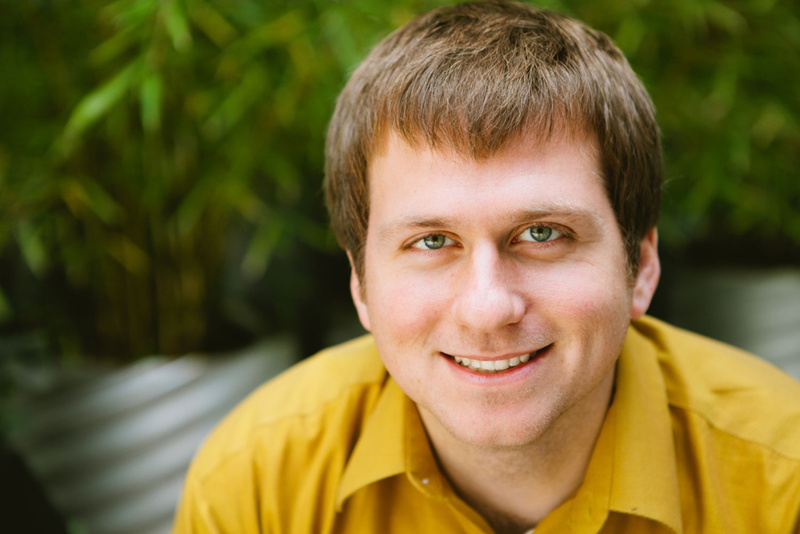 Cody is a Senior Associate at Weber Thompson. 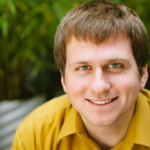 An Architect with ten years of experience, he helps envision, manage and execute projects ranging from Living Building commercial offices to mixed use and multifamily residential work. 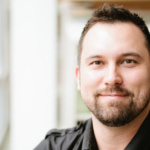 Additionally, he is an advocate for the use of virtual and augmented reality tools in the design industry and regularly uses new technology to communicate spatial experience to clients and end users.